The take-up lever is located directly above the presser foot of a sewing machine. It's the part of the machine that pulls the thread from the spool to feed it through the machine and lifts the thread back up out of the cloth after a stitch has been made. Simply put, it’s the part that goes “up and down” as you sew. The take-up lever is an important part of threading the sewing machine and knowing the upward position of your sewing machine needle. Using the hand wheel and turning it toward you (counterclockwise) will move the take-up lever to the top and will bring your sewing machine needle to its highest position. Always have the take-up lever to the top when placing or removing fabric from under the presser foot to prevent snagging and bending the needle. Always have the machine threaded with the thread in the take-up lever to prevent knotted wads of the thread. Make sure the thread is going through the take-up lever to have the proper tension on the thread, so your stitching is even. Not having the thread in the take-up lever can create a tangled mess of thread. In many newer sewing machines, the take-up lever is hidden inside the body of the sewing machine. It is there and is still the highest point of threading the machine. 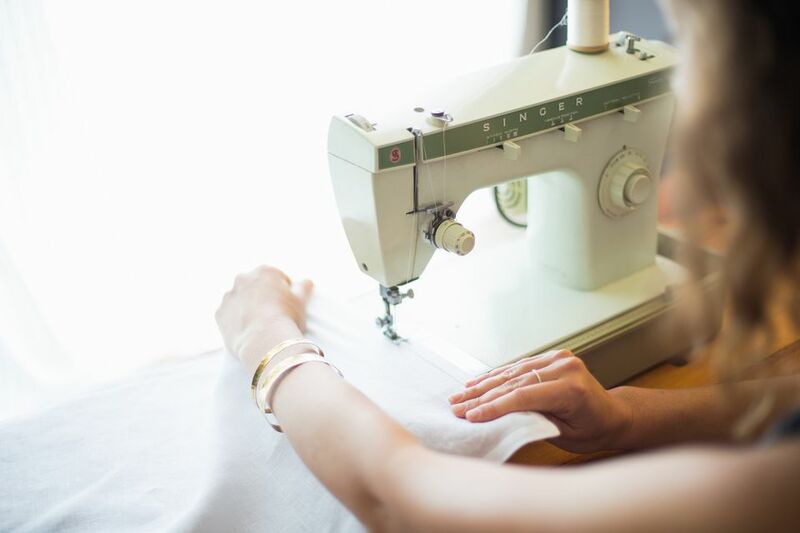 When your sewing machine begins to act up and make a nest of bobbin thread on the underside of your sewing, the first thing you should check is that the upper threading is correct. Odds are the thread has popped out of one of the thread guides. The take-up lever is a common culprit for the thread coming out of the guides. Older machines require you to thread the take-up lever just as you would the eye of a needle. Many newer sewing machines have a slot in the take-up lever which allows you to slide the thread over the take-up lever and it will fall into place in the take-up lever.